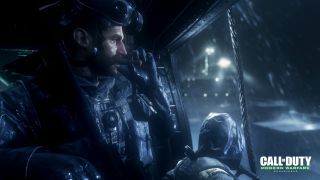 Call of Duty: Modern Warfare was almost as famous for its glitches as it was for its excellent level design, and Modern Warfare Remastered hasn't forgotten that legacy. As discovered by Reddit user DaJeroen, the 2016 version of 2007's breakaway hit contains a small easter egg commemorating one such glitch - a caution: wet floor sign. Some of you are leaning back into your chairs, laughing your butts off, while others are staring at this image confusedly. So let me explain. In the original version of this map, it was possible to angle your character's movement in a way that would cause you to fall through the roof of the building you see, glitching outside of the map. This made it easy to travel across the map quickly and without getting hurt, even leading players to a hidden machine gun weapon capable of dealing massive damage. Developer Raven Software seems to have fixed the glitch, but it's cool that the studio knew enough not just about the game, but the community playing it that they would throw in this little wink and nod. What are some of your favorite glitches in games?